Since today is Halloween, I decided to review a book about Halloween, called Halloween (2003). This book is hilarious. Of course it is. It’s by none other than Jerry Seinfeld. He perfectly captures the spirit of Halloween. He begins the books by saying… When you’re a kid you can eat amazing amounts of food. All I ate when I was a kid was candy. Just candy, candy, candy. And the only really clear thought I had as a kid was get candy. In the grocery store. In the mini-mart. At his grandparent’s house. Looking out the window. Alllllllll the time. That’s all he thought about was how to get his next fix of candy. So, imagine his glee over discovering Halloween where, for a whole night, people just give it away. His young mind couldn’t process that. Are you serious? They’re just giving it away. The fools!!!! The first couple of years he made his own costumes. A ghost one year. A hobo the next. However, those were just the beginning. He was in training for the real thing- Superman. One day he was going to get the real Superman Halloween costume from the store. You know the one…The cardboard box….the cellophane top…mask included in the set. He then reminisces about the rubber band on back of the mask…that broke almost as soon as you put it on. Then you had to get your friends to wait up as you tried to fix it. “Because”, he says, “when you’re little, your whole life is up. You want to grow up. Everything is up! Wait UP! Hold UP! Shut UP! Mom, I’ll clean UP! Just let me stay UP! So, the day finally comes when he convinces his parents to buy him an official Superman Halloween-store costume. Well, what do you think happened? Did it fit just the way he wanted it to? Did he get all the candy he wanted? I guess you’re going to have to read it and find out for yourself. You’ll like it. It’s too cute! As always, pick it up at your local library or bookstore. Happy Halloween everyone. Have fun, but above all, be safe! True, I have been sidelined with this no job having thing. I truly did not think it would take this long. True, I did think I would have a job by now. I was probably even a little cocky. However, I am back to my old humble self. True, I have been a bit discouraged, of late, but I am no benchwarmer. I am not the guy who will never get any playing time in the game. EVER!!! I am not the slacker who rests on their laurels. I have had tremendous success in the past and I will have even more tremendouser (That’s right, I wrote tremendouser) success in the future. I push myself to the limit. I want to squeeze every bit of learning out of a kid that I can. Believe me, dear readers. I am down on the sidelines right now, but I am definitely not out of the game. That bench will soon be cold!!! Well, obtaining that list of available teaching positions from L.A.U.S.D. is going to be easier said than done. What is the problem????? Well, the problem is that access to L.A.U.S.D. e-mail is necessary to obtain the list. Other problem????? If you’re not a current employee, you do not have access to L.A.U.S.D. e-mail. I tried for half the morning, calling over & over, on hold for more than 30 minutes each time, only to be told (each time) that I could not gain access to the e-mail. Correct me if I’m wrong, but there is some sort of disconnect here. I need access to the e-mail in order to obtain this oh so elusive list, in order to be gainfully employed again, so I can gain access to said e-mail. ^^^ (Those are raised eyebrows, by the way). I need help. I need a job. If anyone reading this has access to this list, please let me in on some of the action. Please. A teacha’ needs a job. You can e-mail me @ specialedandme@gmail.com. 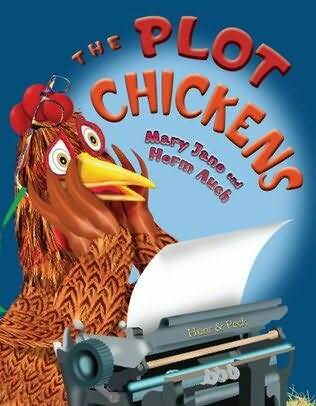 The Plot Chickens (2009) by Mary Jane & Herman Auch was the cutest little book. I really liked it because it can be used during English/Language Arts time to help children with the writing process. The illustrations were a very colorful mixed media mishmash. They were quite enjoyable to look at. Now, on to the review. The story begins with Henrietta Hen who loves to read. She loves to read so much, she’s read all the books on her farm. There’s nothing more to read. Now, she must go into town to the library to get more. She goes into the library & gets in line. As she gets to the counter, the librarian tells her that they have nothing for chickens there. Henrietta indignantly clucks at the top of her lungs. BUK, BUK, BUK! “Well, why didn’t you say so?” says the librarian as she hands Henrietta three books. Henrietta takes the book home to her four aunts who love being read to. Every day she reads the books to them and returns to the library for more. Now, this is where one of my favorite parts come in. Henrietta loves reading so much, she wonders if writing them is as much fun. She does what anyone is serious does. She researches it. She finds a book, goes home and reads it, and promptly begins writing her own book. I love, love, loved this part. This part reminds me so much of Phillise. She is a read-a-holic. She loved reading so much that she has decided to write her own stories. She is constantly writing her own stories. One of her favorite things to do is to cross popular stories. She wrote one entitled, Fancy Nancy Meets Junie B. Jones. She inserted her own pictures in it and everything. As I write this, she has another one on the backburner. I’m not going to tell the name of that one until she finishes writing it. I am so proud of my little girl. I encourage her to write her own original stories as well. I’m just happy that she enjoys reading & writing. But, I digress. On with the review. While visiting the library, Henrietta comes across an excellent book about writing that has eight writing rules. Rule #1: You need a main character. Rule #2: You need to “hatch” a plot. Rule #3: Give your main character a problem. Rule #4: Develop your plot by asking “What if?”. Rule #5: Write what you know. Rule #7: Make your story come alive by using all five senses. Rule #8: The main character must solve her (or his) own problem. So, with the help of her aunts, she writes a story. What do you think happens? Did Henrietta’s research pay off? Does her book become the #1 bestseller? Well, I guess you’re going to have to read it to find out for yourself. I know you will like this. Especially if you’re an elementary teacher. I can think of a few ways this book can be used in a writing center, after I’ve used it for a read-aloud. I would begin by photocopying the middle of the book that explains how to write a story, along with its explanations & make it into a mini-book for the children to refer to. That is, as soon as I get another class. What would you do with it? Drop me a comment and let me know. Today is, Sam, my oldest son’s 20th birthday. My, how time flies. He was just a baby. Happy Birthday! I just got off the phone with Recruitment & Placement @ Beaudry building and have some very good news. Believe me when I say this made my day. I was a little down yesterday and today. I was told that L.A.U.S.D. just received a list of vacancies today. The list would be going out tomorrow to all displaced teachers. So, be on the lookout in your L.A.U.S.D. e-mail. If you are a displaced teacher and don’t receive this list, try calling Recruitment & Placement @ 213-241-1000 and ask for the certificated specialist in your local district.